We’d love your help. Let us know what’s wrong with this preview of The Proposal at Siesta Key by Shelley Shepard Gray. Penny Troyer never disobeys her parents. But tonight she's bending the rules because Michael Knoxx—the most famous member of the Knoxx Family, a traveling Mennonite evangelical family—is scheduled to speak. Penny has heard of Michael—how he lost part of his leg in a terrible accident and uses the experience to inspire others—and knows she must meet him . . . even if it mea Penny Troyer never disobeys her parents. But tonight she's bending the rules because Michael Knoxx—the most famous member of the Knoxx Family, a traveling Mennonite evangelical family—is scheduled to speak. Penny has heard of Michael—how he lost part of his leg in a terrible accident and uses the experience to inspire others—and knows she must meet him . . . even if it means challenging her parents' strict rules and taking the first step toward her own independence. Though he speaks about living life to the fullest, Michael knows he needs to take his own advice. Life on the road is grueling and Michael wants to slow down, to rest . . . to perhaps meet someone who sees him as a man, not just a celebrity. So when a twist of fate allows him the chance to stay a little longer in Pinecraft, Michael knows God is showing him a new path, especially when he discovers that Penny has also survived a terrible ordeal. To ask other readers questions about The Proposal at Siesta Key, please sign up. "The Proposal at Siesta Key" by Shelley Shepard Gray is set in an Amish / Mennonite community town called Pinecraft, in Sarasota, Florida. It's the Amish version of Las Vegas, Nevada, the phrase "what happens here stays here", but for the Amish it's more cleaner and faithful way of letting go of your strict community back home. This time in "The Proposal at Siesta Key", we start with Penny Troyer and her parents who left their troubles in Ohio to start over. Or so Penny thought, but for the last "The Proposal at Siesta Key" by Shelley Shepard Gray is set in an Amish / Mennonite community town called Pinecraft, in Sarasota, Florida. It's the Amish version of Las Vegas, Nevada, the phrase "what happens here stays here", but for the Amish it's more cleaner and faithful way of letting go of your strict community back home. This time in "The Proposal at Siesta Key", we start with Penny Troyer and her parents who left their troubles in Ohio to start over. Or so Penny thought, but for the last twelve years her parents have not been able to do that for themselves nor for Penny. Penny is twenty-four and is ready to do the things that most girls have already done at the age of sixteen in most Amish communities; courting, going to group events, get a job outside of the home, or simply walking the streets by one's self. Nope Penny's parents don't allow her to walk the streets by herself much, all for what happened in Ohio twelve years ago. Michael Knoxx is the most famous member of the Knoxx Family, who are a traveling Mennonite evangelical family. Michael is scheduled to speak in Pinecraft, about his life experience, but mostly the terrible day that he lost his leg. Penny has her mind made up that she is going to go hear Michael Knoxx speak, even if her parents are against it. Michael's message touched Penny that night. And from here Penny's and Michael's journey begins. I loved reading "The Proposal at Siesta Key" by Shelley Shepard Gray and the message that came out while reading it. I like reading Shelley Shepard Gray's book because her selection of topics or events are different, even if the message may not always be different from other authors. To put it simply, reading a Shelley Shepard Gray story is pure pleasure, and I have eagerly anticipated book #2 in The Amish Brides of Pinecraft series. The Proposal at Siesta Key is technically Amish fiction with strong romantic elements, but its strength is in characterization, relationships, and a vivid sense of place. Pinecraft, the small Amish community in the heart of Sarasota, Florida, offers a different, more relaxed atmosphere than most traditional Amish fiction. Shelley has made this community come alive and I'd love to have some ice cream from Olaf's, pie at Yoder's, and shop at the produce market. And much thanks to the design team for a cover that captures the essence of Penny Troyer and the Siesta Key setting. I enjoyed the easy reading of The Proposal at Siesta Key and recommend it to fans of character-driven stories with sweet romance. Tragedy had struck the Troyer family. They had lost their eldest daughter in a very horrible way. Penny was twelve years old at the time of her sister’s death. In this second book of the Amish Brides of Pinecraft we travel back to the beautiful, sunny little Florida town. We are re-united with old friends and make some new ones. to tight a reign on her since Lissy’s death all those years ago b Tragedy had struck the Troyer family. They had lost their eldest daughter in a very horrible way. Penny was twelve years old at the time of her sister’s death. to tight a reign on her since Lissy’s death all those years ago back in Ohio. She’s never allowed to leave the house alone. Penny wants what everyone her age wants…she wants friends, she wants to go places, she wants a life! One night Penny decides she’s had enough and plans to go to the Park to hear a missionary family, The Knoxx Family, speak. Michael Knoxx speaks of his ordeal that cost him most of his right leg and his faith in God that kept him going. Getting out was not easy for her and she had to stand up to her parents and speak her mind. Something not done among the Amish. The next thing on Penny’s list was to get a job and become independent. She was hired at the Orange Blossom Inn. Michael Knoxx just happened to be there recuperating from surgery. One of Penny’s duties is to make sure Michael is comfortable and has everything he needs. She takes him his meals,snacks,whatever he wants. A friendship blossoms between the two. Does this friendship grow into something more? What is the proposal at the beach? Actually,there are two of them. You’ll have to read this wonderfully written book to find out. I absolutely loved it and didn’t want it to end and neither will you! Thank you Shelley for another great read!! This is another wonderful addition to the Amish Brides of Pinecraft series. It can also be read as a stand alone if you have not read book one. I find that I absolutely fly through Shelley Shepard Gray’s books because I love them so much. This one is no exception. The community of Pinecraft is interesting, but what really captured me was the relationship that developed between the two main characters. They were, at first glance, opposites in every way. Penny was sheltered and shy, while Michael w This is another wonderful addition to the Amish Brides of Pinecraft series. It can also be read as a stand alone if you have not read book one. I find that I absolutely fly through Shelley Shepard Gray’s books because I love them so much. This one is no exception. The community of Pinecraft is interesting, but what really captured me was the relationship that developed between the two main characters. They were, at first glance, opposites in every way. Penny was sheltered and shy, while Michael was outgoing and had seen much of the world. But, I just loved the way they connected and it became apparent how they valued the same things. Their romance was so sweet. I also really liked that Michael Knoxx was a man with a disability. It made this story so interesting. Also wonderful was the way Penny loved Michael just as he was. It was great to see her grow in confidence with Michael and also with her parents, and the difficult home situation she was in. I definitely recommend this wonderful story to fans of Amish fiction. My thanks to the publisher and to Litfuse Publicity for the complimentary copy of this book that I received in exchange for an honest review. (Sigh!!) That is what I do whenever I read any of Shelley Shepard Gray's Amish novels. First, because they are so exceptionally well written that I simply forget where I am for the duration of the time it takes me to read it (in one sitting), and the other because I am so sad that it's over too soon! Once again, Shelley takes us back to Pinecraft, Florida in her second installment of the Amish Brides of Pinecraft series, with The Proposal at Siesta Key! This was inspired by a true life event Shel (Sigh!!) That is what I do whenever I read any of Shelley Shepard Gray's Amish novels. First, because they are so exceptionally well written that I simply forget where I am for the duration of the time it takes me to read it (in one sitting), and the other because I am so sad that it's over too soon! Once again, Shelley takes us back to Pinecraft, Florida in her second installment of the Amish Brides of Pinecraft series, with The Proposal at Siesta Key! This was inspired by a true life event Shelley witnessed when visiting the Amish town of Pinecraft and saw a small group of missionaries sharing their story with those gathered and this inspired her to write about the Knoxx family, Mennonites who were taking their story on the road of what their son Michael endured with the loss of his leg during a bike accident. Now feeling it has been a calling from God on their life, they find themselves as guests at the Orange Blossom Inn while spending a couple days on their tour sharing the story. It will be one that will be both life-changing and unforgettable. Penny Troyer at 24, is trying to find a way to tell her parents, that all their protectiveness they have had in her life, is gotten to the point where she feels she isn't living a life but merely existing in theirs since the tragedy that took the life of her sister Lissy and left them wanting to protect the only daughter they have left. But what it has done in the process is eliminated the chance for Penny to establish friends and do all the kinds of things a young teenage girl would have, to find someone to love and perhaps even get a job. Now she simply needs to find a way to tell them she wants to go with a friend to see the traveling Knoxx family at the park, but the conversation happening in her mind is much easier than the one she will be having with both of her parents. We are introduced to characters in the first book titled, The Promise of Palm Grove along with a wonderful B & B. The setting is sunny Florida in the small town of Pinecraft that is close to the ocean along with a wonderful, close knit, Amish community. The Orange Blossom B & B is operated daily by Beverly. Recently she hired a young lady named Penny Troyer to care for Michael Know while he recoups after surgery. Trouble begins to brew when Beverley’s unhealed heart is hurt when she thinks she views an improper moment between Michael and Rachael. Now, after taking time to pray, she is confronted by the owner, Eric, as he learns about owning this business he inherited. On top of this, Tricia comes to surprise her Aunt Beverly, running away from an embarrassing situation at home. There is romance blooming with a new set of young people in the community and there really isn’t much reference to the characters readers met in book one. I was a little disappointed by that as I came to enjoy them in the first story. There is a third book that I will be reading titled, A Wedding at the Orange Blossom Inn by the same author. Perhaps the characters not written into the second book will show up more in book three. Either way I know I laughed a lot while reading this tale because of the way one guest of the inn was expressing how she viewed Florida. Please consider reading the books written by Shelley Shepard Gray as they are highly entertaining, faith filled and have moments of climax with tension that make for an enjoyable afternoon of getting lost in the fictional town of Pinecraft! There's something so magical about the way Shelley Shepard Gray writes. Her words just seem to flow, creating vivid images in my mind. I get a shiver of bibliodelight when I open one of her books, eager to be transported into another life for a time. So I'm afraid I devoured The Proposal at Siesta Key in one sitting and it was over much too soon! This is the second book in the Amish Brides of Pinecraft series but there's no need to read the first one (though you ought to!) before reading this one. It reads beautifully as a standalone, though there are a few overlapping characters fans of the first book will be happy to meet up with again. And one over-arcing thread that I'm thinking is going to turn romantical, simmering on the back burner. Penny's unusual backstory really intrigued me. It's shaped her right into adulthood and, in a way, this is her coming of age story. She begins to discover her strengths and potential. In contrast, Michael is definitely living out his potential but once he meets Penny he starts rethinking his future. A deliciously simple yet complicated love story that's sure to satisfy. My thanks to Litfuse Publicity Group and Avon Inspire for supplying me with a review copy of this book. Shelley Shepard Gray always manages to bring reality to the fiction blending factual Amish places in detail, fictional characters come to life and become real in your heart. Pinecraft and the story of Penny and Michael and young love comes to life. The trials their families endure are everyday and possibly happen to ordinary people. With every chapter you feel a friendship with the Hero and herorine. If you have not read Shelley Shepard Gray start now and escape to Pinecraft. But new friendships can’t stop time. Soon, Michael's time in Pinecraft will be over and he'll be back on the road. Her time with Michael has brought her happiness, but will she be able to follow her heart? Or will she be faced with the one thing she’s sure she'll never have the courage to do? THE PROPOSAL AT SIESTA KEY stands alone, even though it is the second book in this series. The only continuing story is with Bev who manages the Inn. Fans will want to read the first book The Promise of Palm Grove to discover the beginning of Bev’s story. This story was slow, and seemed to drag a lot at first with Michael and Penny’s backstory. I was not very fond of either character at first as Michael was very rude (though he was hurting) and Penny was beyond disrespectful to her parents. And in retaliation, her parents went over-the-top in their response. However, by the end of the book my attention was grabbed and I liked both Penny and Michael. I also liked how Michael handled his relationship with his family. Fans of Ms. Gray will enjoy reading this story. I am looking forward to reading the third book in this series later this year. Recommended to fans of Amish fiction . 4 stars. Available in ebook, audio, library binding, and paperback. 288 pages. I received this book from the publisher via Litfuse in exchange for an honest review. Reading/listening to a Shelley Shepard Gray story is pure pleasure, and I have eagerly anticipated book #2 in The Amish Brides of Pinecraft series. The Proposal at Siesta Key is technically Amish fiction with strong romantic elements, but its strength is in characterization, relationships, and a vivid sense of place. Pinecraft, the small Amish community in the heart of Sarasota, Florida, offers a different, more relaxed atmosphere than most traditional Amish fiction. Shelley has made this community come alive and I'd love to have some ice cream from Olaf's, pie at Yoder's, and shop at the produce market. And much thanks to the design team for a cover that captures the essence of Penny Troyer and the Siesta Key setting. The Proposal at Siesta Key" by Shelley Shepard Gray is set in an Amish / Mennonite community town called Pinecraft, in Sarasota, Florida. It's the Amish version of Las Vegas, Nevada, the phrase "what happens here stays here", but for the Amish it's more cleaner and faithful way of letting go of your strict community back home. The community of Pinecraft is interesting, but what really captured me was the relationship that developed between the two main characters. They were, at first glance, opposites in every way. Penny was sheltered and shy, while Michael was outgoing and had seen much of the world. But, I just loved the way they connected and it became apparent how they valued the same things. Their romance was so sweet. The second book of Shelley Shepard Gray’s Amish Brides of Pinecraft, The Proposal at Siesta Key delivers a tale of Pinecraft romance just as charming as the first (The Promise of Palm Grove). While revisiting Pinecraft and some of its familiar faces, Gray introduces two fresh characters to take the lead - Penny Troyer and Michael Knoxx, both dealing with past tragedy and trauma and needing a bit of independence. As they cross paths, strike up an unlikel This review is also posted on Book by Book. 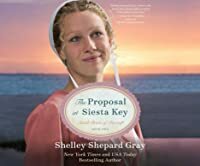 The second book of Shelley Shepard Gray’s Amish Brides of Pinecraft, The Proposal at Siesta Key delivers a tale of Pinecraft romance just as charming as the first (The Promise of Palm Grove). While revisiting Pinecraft and some of its familiar faces, Gray introduces two fresh characters to take the lead - Penny Troyer and Michael Knoxx, both dealing with past tragedy and trauma and needing a bit of independence. As they cross paths, strike up an unlikely yet heartwarming friendship and confront the challenges that arise, I happily followed their story from start to finish. A quick yet sweet and engaging read, The Proposal at Siesta Key will surely please any fans of The Promise of Palm Grove and leave them as interested as I am in the third book, A Wedding at the Orange Blossom Inn. 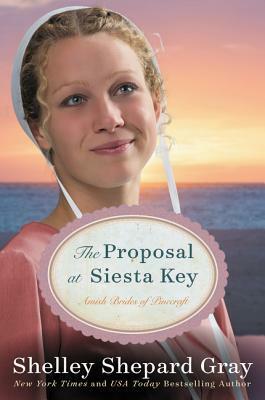 `The Proposal at Siesta Key` opens with author Shelley Shepard Gray's depiction of Pinecraft, Fl. The reader is destined to feel at home while following the places portrayed in the novel. It is the second in a series, "Amish Brides of Pinecraft, Fl." This second novel had some unexpected twists and turns I was not expecting. Shelley Gray considers some serious issues; such as death of a loved one. However, I believe, in some ways, this novel could help heal the reader of inner turmoil from the `The Proposal at Siesta Key` opens with author Shelley Shepard Gray's depiction of Pinecraft, Fl. The reader is destined to feel at home while following the places portrayed in the novel. It is the second in a series, "Amish Brides of Pinecraft, Fl." This second novel had some unexpected twists and turns I was not expecting. Shelley Gray considers some serious issues; such as death of a loved one. However, I believe, in some ways, this novel could help heal the reader of inner turmoil from the past. This is my opinion, not necessarily that of the author. I love author Shelley Gray's writing style, which I believe may validate her personality. Her writing flows naturally from pen to paper. Both novels inhabit Pinecraft, Fl. ; which may be unusual for the Amish to reside. They are each great reading material. I highly recommend the reader digest both books in order; which is to the readers advantage. Also, I would only recommend the series to mature readers only; because of the nature of the second volume. Since reading The Promise of Palm Grove, I have been eager to return to the heart of Sarasota, Florida. In the second book in the Amish Brides of Pinecraft series, Shelley Shepard Gray invites readers back to the small Amish community of Pinecraft and the quaint Orange Blossom Inn. New primary characters are introduced, and familiar favorites are enjoyed in the secondary story line. The Proposal at Siesta Key charmed me from the first page until the last! The story boasts vivid imagery, endearin Since reading The Promise of Palm Grove, I have been eager to return to the heart of Sarasota, Florida. In the second book in the Amish Brides of Pinecraft series, Shelley Shepard Gray invites readers back to the small Amish community of Pinecraft and the quaint Orange Blossom Inn. New primary characters are introduced, and familiar favorites are enjoyed in the secondary story line. The Proposal at Siesta Key charmed me from the first page until the last! The story boasts vivid imagery, endearing characters, a unique story line, and a tender romance. I enjoyed The Proposal at Siesta Key and can’t wait to read the next book in this delightful series! P.S. Don’t miss the great bonus material that is included in the back of the book. In addition to an author’s note and discussion guide, readers can enjoy a Chocolate Pecan Pie recipe, Shelley’s top five must-see spots in Pinecraft, scenes from Pinecraft, and a sneak peek of the next book, A Wedding at the Orange Blossom Inn. I received a complimentary copy of The Proposal at Siesta Key through Litfuse Publicity. I appreciate the opportunity to read this book and share my honest opinion. After leading a sheltered life for the last twelve years, Penny Troyer decides to take matters into her own hands. Her parents relocated to Pinecraft, Florida due to the tragic death of their daughter Lissy twelve years ago and have basically kept Penny under their tight control fearing for her safety as they can't seem to move on with their lives due to the horrific family tragedy. Penny goes to the local park to hear Evangelist Micheal Knoxx and his family speak. Soon after, they develop a frie After leading a sheltered life for the last twelve years, Penny Troyer decides to take matters into her own hands. Penny goes to the local park to hear Evangelist Micheal Knoxx and his family speak. Soon after, they develop a friendship. Michael and Penny each share their hopes and dreams and make a proposal during a visit to Siesta Key Beach. Michael undergoes surgery and while recuperating at the Orange Blossom Inn, Penny is hired as a maid and to look after Michael's needs. I loved some of the secondary characters too. Aunt Beverly and Tricia were fun. The Pinecraft setting evokes a simple but loving community and it was wonderful reading of the blossoming relationship between Penny and Michael. Shelley Shephard Gray takes us back to sunny Pinecraft, Fl in this new delightful book. I greatly admired Penny Troyer for having the courage to stand up to her parents in a respectful way that reqired an inner strength that came from her strong convictions. In Penny's quest to gain indepedence she needs to find a job and this is where the fun begins! We are reunited with beloved characters and familiar places from the first book in the series and meet some new characters that stole my heart. The story moves flawlessy as I've come to expect from this talented author. Ms. Gray's attention to details are impeccable and her ability to create characters that seem so real is one of the reasons I always look forward to reading her books. This is a book that you can share with your mothers, grandmothers, daughters and ladies from your church. If you or anyone you know is looking for a summer read, I highly recommend this one. Even though, it's the second book in the series, this could easily be a standalone novel. Another well written book by Shelley Shepard Gray! No matter how bad your situation is or how overwhelmed life has you feeling, God is there for you and so are your family and friends. This is a main theme throughout this book. The characters rely on love and faith to see them through their life struggles. You are reunited with some of the characters from Book 1 in the Amish Brides of Pinecraft series, but you don't have to read Book 1 to follow the storyline, but I highly recommend you do, since Another well written book by Shelley Shepard Gray! No matter how bad your situation is or how overwhelmed life has you feeling, God is there for you and so are your family and friends. This is a main theme throughout this book. The characters rely on love and faith to see them through their life struggles. You are reunited with some of the characters from Book 1 in the Amish Brides of Pinecraft series, but you don't have to read Book 1 to follow the storyline, but I highly recommend you do, since it's a great series. One of the new characters in The Proposal at Siesta Key is Penny Troyer, and she is a pistol. She has the guts and courage to stand up to her parents and make them see that there is a life out there - to stop hiding from it and enjoy it. She goes after what she wants - happiness! Shelley Shepard Gray's Amish stories are always an enjoyable read -- and The Proposal at Siesta Key is no exception. Set in Sarasota, Florida, the Amish Brides of Pinecraft series brings together Amish and Mennonite characters who are living a lifestyle a little different from the typical horse and buggy Plain people we frequently find in Amish fiction. If you have read book one of this series, The Promise of Palm Grove, you will recognize the Orange Blossom Inn and the continuing story of some o Shelley Shepard Gray's Amish stories are always an enjoyable read -- and The Proposal at Siesta Key is no exception. Set in Sarasota, Florida, the Amish Brides of Pinecraft series brings together Amish and Mennonite characters who are living a lifestyle a little different from the typical horse and buggy Plain people we frequently find in Amish fiction. If you have read book one of this series, The Promise of Palm Grove, you will recognize the Orange Blossom Inn and the continuing story of some of its characters. Shelley uses the relationship that develops between Penny and Michael to present a delightful story of friendship and personal growth. The other characters each add interesting elements to the story and open up the possibilities of more good things to come in the remainder of the series. "The Proposal at Siesta Key" is the second book in the "Pinecraft Brides" series. I had the chance to read the first book and was excited to learn I would be reviewing this one as well. It is oh so beautifully written. Shelley Shepard Gray has a way with writing that will capture your heart. She has quickly become one of my favorite authors. I don't often give a book 5 stars, in fact I can count on one hand the number of "5 star" reviews I've given books...but this book, no...so far this series w "The Proposal at Siesta Key" is the second book in the "Pinecraft Brides" series. I had the chance to read the first book and was excited to learn I would be reviewing this one as well. It is oh so beautifully written. Shelley Shepard Gray has a way with writing that will capture your heart. She has quickly become one of my favorite authors. I don't often give a book 5 stars, in fact I can count on one hand the number of "5 star" reviews I've given books...but this book, no...so far this series would get a 5 star! Be warned once you start reading this book you will feel like you are in Florida at the Orange Blossom Inn. This book will sweep you off of your feet and will have you impatiently waiting for the third book in the series! The Proposal At Siesta Key by Shelley Shepard Gray was a great story. I did read the first book in this series but you won’t be lost if this is the first book you pick up and read in the series. I love all the books that Shelley has written about the Amish so going into this book I expected to love it as well. I always get worried when I start reading a book and already expect the book to be amazing because I have been let down before but this book didn’t let me down at all. I loved this book. I The Proposal At Siesta Key by Shelley Shepard Gray was a great story. I did read the first book in this series but you won’t be lost if this is the first book you pick up and read in the series. I love all the books that Shelley has written about the Amish so going into this book I expected to love it as well. I always get worried when I start reading a book and already expect the book to be amazing because I have been let down before but this book didn’t let me down at all. I loved this book. I instantly loved Penny from the first page right through the end. At the start of the book I wasn’t a huge fan of Michael but after I was a few chapters in I did start to like him as well. I loved that we got to check back in with some of the characters from the first book as well because I like to see how they are doing. If you love Amish fiction than I would for sure recommend this book to you. This is the second book in the Amish Brides of Pinecraft. We continue the story of Beverly as she runs the Orange Blossom Inn. However Eric has entered the picture as the newly proclaimed owner of the Inn. This poses some awkwardness as we along with Beverly discover his intentions. Penny is living a very sheltered life brought on by her parents fear. When she comes to the realization that it is time to become independent it serves to enhance not only her life but others around her also. After t This is the second book in the Amish Brides of Pinecraft. We continue the story of Beverly as she runs the Orange Blossom Inn. However Eric has entered the picture as the newly proclaimed owner of the Inn. This poses some awkwardness as we along with Beverly discover his intentions. Penny is living a very sheltered life brought on by her parents fear. When she comes to the realization that it is time to become independent it serves to enhance not only her life but others around her also. After taking a position at the Inn Penny finds not only the independence she is seeking but friendship and romance as well. The new job at The Orange Blossom Inn involves not only cooking and cleaning but taking care of the needs of the famous Michael Knoxx! Michael Knoxx is also on a journey towards independence and together these characters and their families will draw you in and keep you wanting more. I liked this cute romance about living each day to the fullest! I really liked Penny and admired her determination to change her life. She had a lot of courage, especially knowing what a dangerous place the world can be. There were some amusing moments and some sweet romantic ones. Penny and Michael both had a strong faith in God, but he was Mennonite and she was Amish and their differences were never really addressed. I liked getting reacquainted with Bev and her situation with the new owner of I liked this cute romance about living each day to the fullest! I really liked Penny and admired her determination to change her life. She had a lot of courage, especially knowing what a dangerous place the world can be. There were some amusing moments and some sweet romantic ones. Penny and Michael both had a strong faith in God, but he was Mennonite and she was Amish and their differences were never really addressed. I liked getting reacquainted with Bev and her situation with the new owner of the inn. This works well as a stand-alone, though there was some information about Bev you learned in the first book. I look forward to seeing how her story gets resolved. I absolutely loved the setting and relaxed atmosphere. I'd recommend this book to women who like Amish stories. In the second book of the Amish Brides of Pinecraft series, Penny is learning to live after a lifetime of being sheltered. Her sister was kidnapped and killed when she was young and her parents haven’t let her out of their sight since! Now that she is in her 20’s, she’s ready to get a job and meet some people. When she is hired to care for a missionary “celebrity”, Penny finds herself falling for him. Shelley’s books about the Amish life in Pincraft, Florida are interesting and easy reads. There In the second book of the Amish Brides of Pinecraft series, Penny is learning to live after a lifetime of being sheltered. Her sister was kidnapped and killed when she was young and her parents haven’t let her out of their sight since! Now that she is in her 20’s, she’s ready to get a job and meet some people. When she is hired to care for a missionary “celebrity”, Penny finds herself falling for him. Shelley’s books about the Amish life in Pincraft, Florida are interesting and easy reads. There isn’t really any depth to them, but they are a great book to pick up for a relaxing, no-brainer afternoon. The characters are cute and the plots are simple. Gray writes in an Amish community but the characters could be anywhere. This time she show great empathy for a man who was injured as a teen and continues to deal with situations related to his prosthetic leg. Some young women want to be close to him because he somewhat of a celebrity giving inspirational talks and traveling the world. He's not always sure who he can trust to be sincere. He encounters a woman who has had issues of her own and is not impressed with his celebrity but is concerned abo Gray writes in an Amish community but the characters could be anywhere. He encounters a woman who has had issues of her own and is not impressed with his celebrity but is concerned about his well-being. Penny's family had suffered a tragedy and not being able to stay in their home place moved to Saratoga, Floria where her family kept her close in their fear that something would happen to her as well.. I did not read the first book but really enjoyed reading this one. One night she stepped out and wet to the Park to hear a missionary family with Michael Knoxx's telling his story of faith and depending on God to keep him going. After going against her parent's wishes by going out to the Park, she Penny's family had suffered a tragedy and not being able to stay in their home place moved to Saratoga, Floria where her family kept her close in their fear that something would happen to her as well.. I did not read the first book but really enjoyed reading this one. One night she stepped out and wet to the Park to hear a missionary family with Michael Knoxx's telling his story of faith and depending on God to keep him going.